You’ve finally decided to live a healthier life, and part of your game plan is to regularly drink all-natural fruit juices. However, instead of buying just any brand, you want to try making your own. For this, you should consider investing in a reliable blender. If you’ve searched the internet, you have probably encountered how in-demand the NutriBullet 12-Piece High-Speed Blender/Mixer System is. If you are still skeptical about how effective this product is, just read on. In this review, we’ve rounded up some of the product’s best features. We have also summarized its pros and cons for you to weigh. The decision is yours, but we have high hopes that this information will be of great help. Pulverize fruits, vegetable and other superfoods without breaking a sweat using this awesome blender and mixer system. Here are some of the best features of the product. It has a 600-watt motor, and can operate at 10,000 rpm. The parts of this blender/mixer system are all dishwasher safe. This makes the sanitization process way more efficient than products that require traditional hand washing. In case you’re wondering what sets this product apart from its rivals in the market, here’s a quick rundown. Despite all the positive reviews NutriBullet is getting, it is not without flaws. In this section, we’ve also included the negative reviews brought up by the product’s customers and users. Have you been wanting to get your health back on the right track? Treat the health buff in you with delectable, all-natural drinks using the NutriBullet 12-Piece High-Speed Blender/Mixer System! This portable and compactly designed blender/mixer is a multi-purpose kitchen buddy that can shred, blend, grind and even chop. 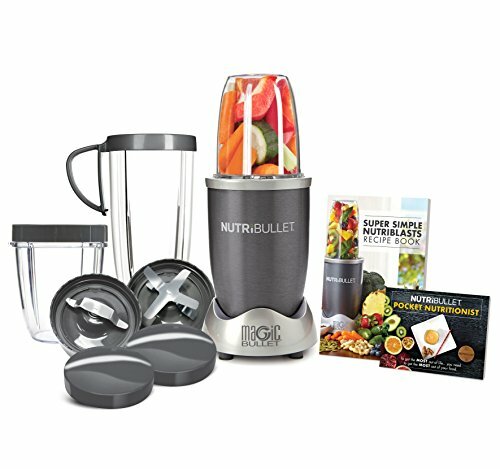 If you’re looking for an appliance that does all these without hurting your wallet, then the NutriBullet 12-Piece High-Speed Blender/Mixer System is your perfect choice.